We hope that everyone had a wonderful Mother's Day weekend! 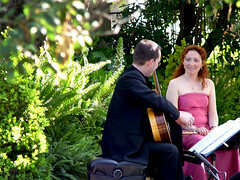 We had a lovely one here at the Lenkin Gardens: in collaboration with the Da Camera Society we hosted three concerts featuring the world-reknown Cavatina Duo, who were making their Los Angeles debut. 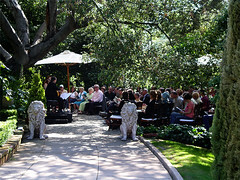 Many guests and Mothers explored and mingled in the Lenkin Garden prior to the performances, which were held in the Dry Garden. 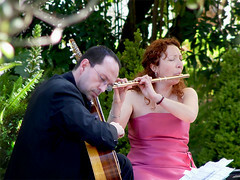 Our very old live oak tree provided a magnificent backdrop for the Cavatina Duo, which is comprised of Spanish flautist Eugenia Moliner and Bosnian guitarist Denis Azabagic. 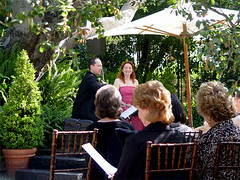 Their amazing musical talent and passion invigorated the gardens with selections that reflected being in nature. They performed Piazolla's "Four Seasons of Buenos Aires," Bartok's "Romanian Dances," Francois Borne's "Carmen fantasy," and Balkan pieces written especially for the Duo. 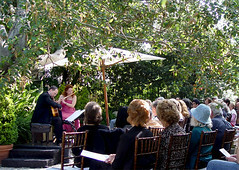 It was truly enchanting to watch them perform with such extraordinary and sophisticated playing, especially since it was their first performance in a garden. The Da Camera Society has been bringing chamber music to unique historical spaces in Southern California for almost 35 years. We are quite honored to be included with sites like the Bradbury Building or the Doheny Mansion! We managed to take a few photos of the concert event despite how mesmerized we were! 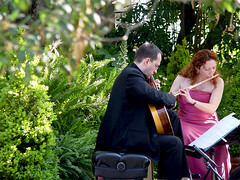 We want to thank The Cavatina Duo for performing at the Lenkin Gardens, The Da Camera Society for making this happen and to all the wonderful guests who shared this amazing moment with us.